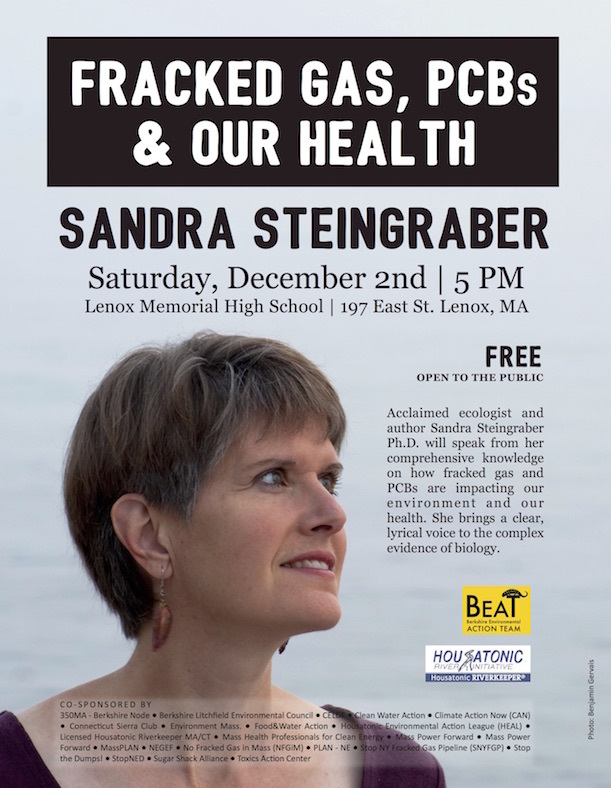 On December 2nd, Sandra Steingraber, renowned ecologist and author will speak about how PCBs, fracked gas, and pipelines are impacting ecological and human health at 5 PM at Lenox High School, 197 East Street, Lenox, MA. Steingraber brings a clear, passionate voice to the complex evidence of biology. Dr. Steingraber’s 1997 book Living Downstream: An Ecologist’s Personal Investigation of Cancer and the Environment changed the way we think about toxic chemicals and their connections to cancer. Living Downstream was based on by Steingraber’s personal journey as a cancer survivor and her career as a scientist. In 2010 the book was released as a film. Steingraber has written extensively about topics ranging from climate change and toxic chemical exposure to developmental and reproductive disorders. Steingraber’s other works include Raising Elijah: Protecting Children in an Age of Environmental Crisis, Having Faith: An Ecologist’s Journey to Motherhood, and Post Diagnosis. She also is featured in the recent documentary “Unfractured” as an activist speaking out about the environmental risks of fracking. PCBs (Polychlorinated biphenyls) are the toxic chemical that pollutes the Housatonic River and has contaminated the food chain of the earth. Fracked gas and the pipelines carrying that gas have been on the frontline of environmental debates as severe dangers to the environment. The presentation begins at 5 PM and will be followed by a question and answer period, as well as a book-signing.